Fyfe, Richard W.. "Falcon". The Canadian Encyclopedia, 01 August 2018, Historica Canada. https://www.thecanadianencyclopedia.ca/en/article/falcon. Accessed 24 April 2019. The falcon (family Falconidae) is a small to medium-sized predatory bird noted for its swiftness in flight. Also called a sparrow hawk, the kestrel is the smallest, most widespread, and most colourful falcon, living in open spaces and cities (photo by Pierre Bernier/Gouvernement du Québec). The falcon (family Falconidae) is a small to medium-sized predatory bird noted for its swiftness in flight. With 63 species, falcons range in size from sparrow sized (the falconet of southeast Asia) to raven sized (the powerful, arctic-dwelling gyrfalcon). Falcons tend to have more distinctive plumages than most other birds of prey, frequently having striking facial patterns or contrasting markings. They are characterized by large, dark brown eyes, a hooked beak with a toothlike projection on the mandible, and a small tubercle in the centre of each nostril. Most have very distinctive, long, pointed wings and a long tail. 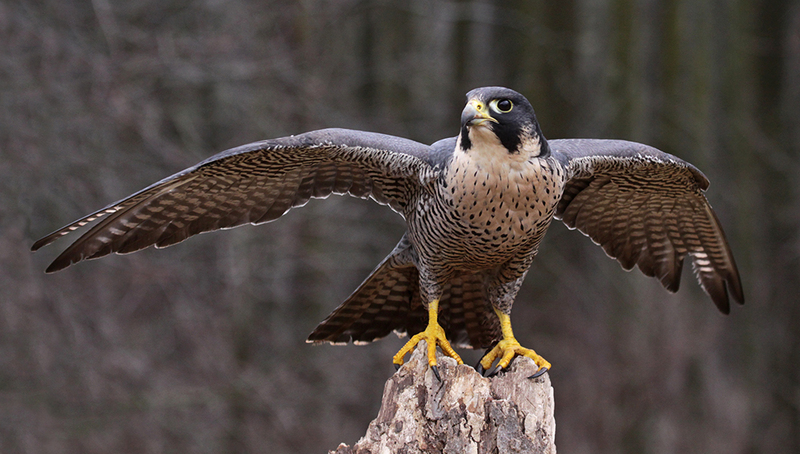 Female falcons are noticeably larger than males. 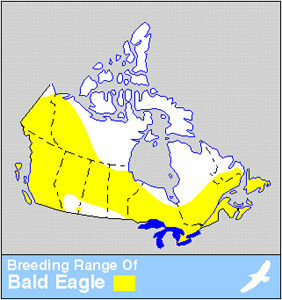 Five falcon species breed in Canada. 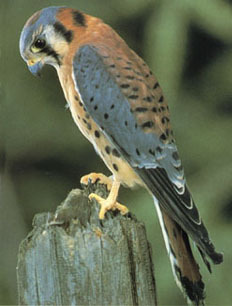 The brightly coloured, robin-sized American kestrel (Falco sparverius) is relatively common and, except in winter, may be seen perched or hovering along roadsides from coast to coast. 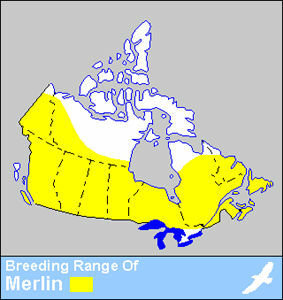 The more elusive merlin (F. columbarius) also lives across the country. 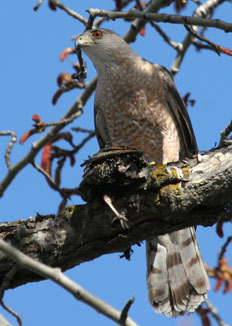 Recently, merlins have become more common in urban areas in western Canada. 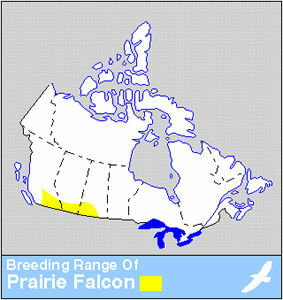 The crow-sized, sandy-coloured prairie falcon (F. mexicanus) is restricted to grasslands and, although fairly abundant, is seen only in very specific habitats in the Prairie provinces or in some interior valleys of BC. 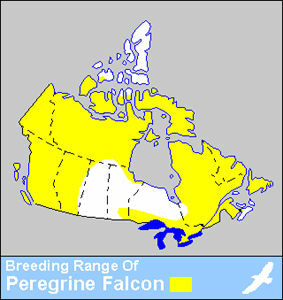 The peregrine falcon (F. peregrinus), similar in size to the prairie falcon, formerly bred wherever suitable nesting habitat and prey were found. Its numbers have been greatly reduced by DDT, which softens its eggshells so few young are born. The gyrfalcon (F. rusticolus) of the Canadian Arctic feeds mainly on ptarmigan and arctic hare. Although its population fluctuates in relation to prey, it has not been affected to any great extent by pesticides or other pollutants. Because of their speed, many species have long been prized by falconers, who train them to hunt. 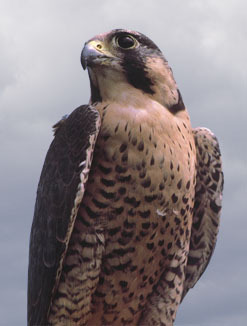 Gyrfalcons and peregrine falcons have become status symbols for falconers worldwide.